How MODE, a growing new franchise, was inspired by an unexpected delivery. Ciara Stockeland started her retail career with a little maternity boutique in her hometown of Fargo, N.D. In 2006, about a year after she opened, a trucking company reached out for help: It had accrued a couple of semitrailers full of overstocked merchandise and needed to offload it. “I rarely say no to an opportunity,” says Stockeland, who promptly set up a pop-up shop next to her fancier store to sell this random assortment of goods: shoes, clothing, accessories and household items. She put it all out in cardboard boxes on folding tables. And then an unexpected thing happened: People ransacked the bins. “Consumers loved getting these outlet deals. I took a step back and said, ‘This works and makes money -- it’s probably a smarter way to go,’” she says. So she ditched her boutique and, because pulling random goods off semitrucks isn’t a solid business model for anyone, began purchasing extras directly from designers and manufacturers. Her new concept, which she called MODE, offered 70 to 75 percent off designer retail. It resonated with customers, and by 2010, she began franchising. Now MODE has 10 stores in the upper Midwest and one in South Carolina, with plans to reach 75 units by 2024. MODE is reminiscent of an outlet mall. What’s different? Consumers are really disappointed with outlet malls; they’re not what they used to be. Companies are manufacturing cheaper products just for the outlets. Our consumers are getting real designer products -- the same denim jeans designed for the high-end shelf that were supposed to be $180 but are $40 at our store. So, is this returned merchandise? Or last year’s styles? No; everything we have is brand-new. There are several ways we find inventory. Retailers buy their clothes months ahead and project what they need, but sometimes they have a slower season than anticipated and cancel shipments, which we buy from the manufacturers. Sometimes there are overruns from brands that did well last year but aren’t as big a deal this year. There are also designers that go out of business or rebrand and need to sell off inventory. I’m adding to the list of designers and manufacturers we work with weekly. We’re targeting the people along the I-29 corridor from Fargo down to Texas. We feel our concept really fits the Midwest consumer. These are people who want to be stylish but are very thrifty or economically savvy. 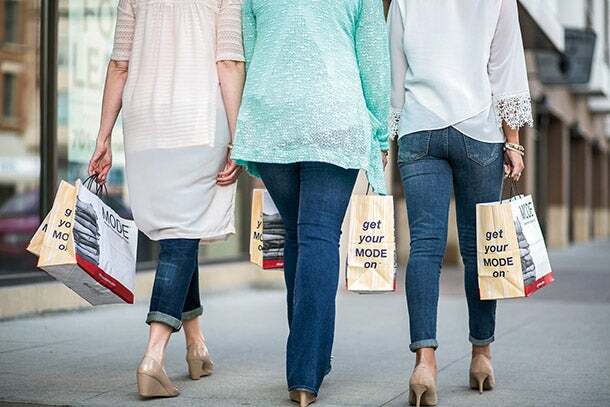 I think we’ll find MODE shoppers everywhere -- consumers who can afford $180 jeans but are very practical people and conservative spenders. Jeans, jeans, jeans. What’s with the denim obsession? I wanted to develop something that set the brand apart. And I knew we were going to have a lot of denim at a price point no one else did, so I trademarked the phrase “Home of the $40 designer jean.” Denim shopping is like swimsuit shopping; women hate it. Unlike boutiques, which carry only small sizes, we have sizes 0 to 22. We always have 300 pairs on the floor at every store -- in Fargo, we have 500. I like to think of it as our $5 footlong; everyone knows we have it, even if they decide to buy something else.